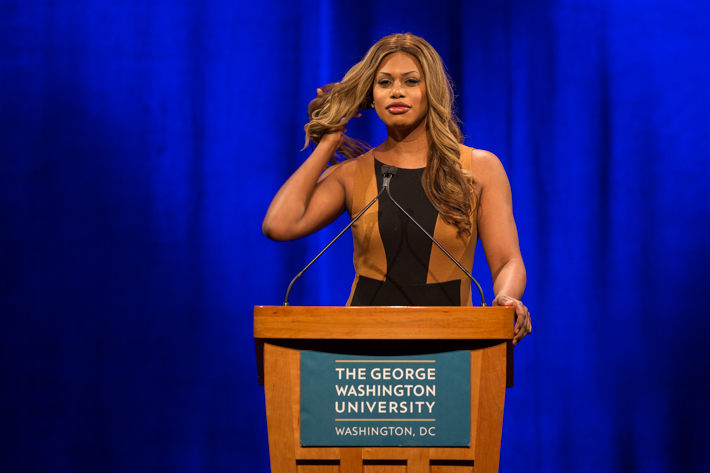 First openly transgender Emmy-award nominee encourages GW students to embrace their complex identities. Laverne Cox is best know for her transgender advocacy and her portrayal of a trans prisoner on Netflix original series "Orange is the New Black." The spirit of that declaration—a celebration of identities often marginalized by society— was the backbone of the “Ain’t I a Woman,” lecture that Ms. Cox delivered to a packed Lisner Auditorium. The event was organized to commemorate International Transgender Day of Visibility, a day of support and affirmation for transgender people. Ms. Cox’s celebrity is an example of an increase in attention nationally on transgender rights activism in the United States. In January, President Barack Obama used the term transgender in his State of the Union address—a first for a U.S. president. Ms. Cox gave a vivid account of how a working-class, conservative Christian upbringing in Mobile, Ala., started her journey of transition from a bullied honor student to a gender-nonconforming young adult and, finally, an icon of transgender advocacy. GW’s student-run organization Allied in Pride—which advocates for lesbian, bisexual, gay and transgender (LGBT) students—organized the event with support from the Program Board, the Student Association, the LGBT Resource Center, the Global Women’s Institute, the Women’s Leadership Program and more than four other organizations. 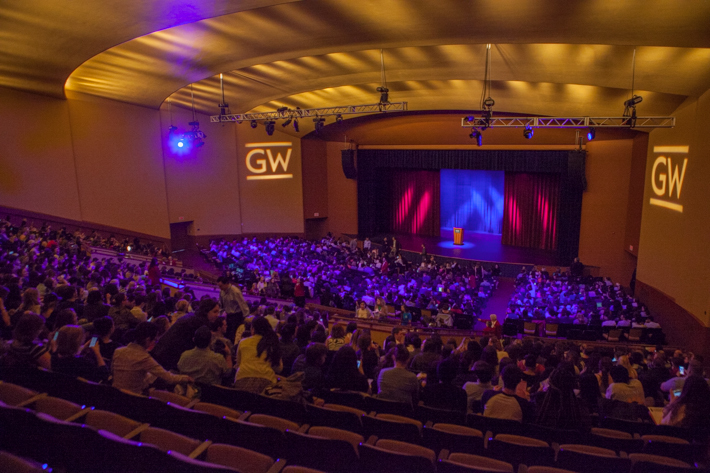 According to GW junior and Allied in Pride President Robert Todaro, the event was part of ongoing collective university efforts to be inclusive of LGBT students. Echoing Mr. Todaro’s remarks, Ms. Cox began her speech by declaring a “state of emergency” for transgender people. She said that more than 70 percent of trans people are victims of violence. About 16 percent are incarcerated, and 41 percent attempt suicide. "Calling a transgender woman a man is an act of violence"
Ms. Cox attempted suicide in sixth grade following the death of her grandmother. Ms. Cox delivered her trademark wit when discussing her sartorial preferences. She said she called her high school wardrobe"Salvation Armani," because she created it by altering women's clothing thrifted from the Salvation Army. Ms. Cox counts a passion for the arts, lessons of oppression and resistance taught by her mother and support from the LGBT community among her saviors. Though she wore women’s clothing during her time at the Alabama School of the Fine Arts—notably a pair of polyester leopard print bell-bottoms—she did not transition to a transgender identity until adulthood. She began hormone treatments to transition from male to female 16 years ago. George Washington University students greeted Ms. Cox with cheers and a standing ovation before she began her "Aint I a Woman" lecture. The speech was modeled after Sojourner Truth's famous May 29, 1851 address at Ohio Women's College. "She gave that speech the same day I was born—but a different year," Ms. Cox deadpanned. Ms. Cox called on students, communities, the justice system and the government to acknowledge that “trans lives matter,” by advocating for equal treatment and protection for all people under the law. She used the death of Islan Nettles—a trans woman who was beaten to death by male cat-callers who realized she was transgender—as an example of the fear of discovery and violence that many trans people live with. Ms. Cox also stressed that the marginalization of trans people is indicative of a wider disenfranchisement of minorities including women, LGBT people and people of color. That system-wide disenfranchisement can lead minority groups to “police each other” and lash out, she said. Ms. Cox put this rhetorical question to the audience: With so many differences and points of view at play, how can we come together to support equality for all? Then, she answered, saying a good place to start is genuine interaction between individuals.